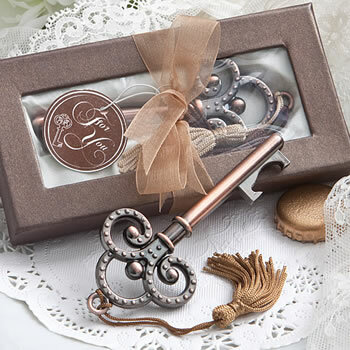 There's something so alluring about a skeleton key wedding favor. In addition to its classic shape, it has an air of mystery, and opens up the possibility of treasure, elegance, romance and so much more. So, Fashioncraft took the skeleton key design and amped it up with an antique copper finish and a useful bottle opener edge. And, the end result is a winner! My son's law school graduation will be a note to all attending..you are the key to my success..and will attach the key. It is beautiful and even nicer than it looks online. Well made..so pleased. I ordered this as a favor sample for a Gala we are planning. This comes in a really nice box just like the picture shows and is very nice, good quality. I was very impressed. We are planning on ordering these as our favor. So I ordered one of these to see if they would work. When it arrived (within a few days) I was so surprised how nice it is! It’s in a nice box and the key is very pretty and most important very sturdy. It way heavier than I expected. I plan to use them for a bachelor party favor. The keys arrived as promised, and I love the quality. This was a perfect favor for our visit to a castle! Love the keys. Fast shipping. Excellent quality. I’m extremely impressed and will be back to order more. Excellent product, excellent delivery time. Looking forward to more purchases! Functionality isn't the greatest, but it gets the job done and is super cute. Found these online just before my father’s 90th birthday party. Really didn’t think they could get them out to me in time but they arrived in time and were perfect! The keys are beautiful, packaged perfectly and were a huge hit at the party. Everyone loved them and wanted to know where I found them. I would definitely order again from this company. These are a wonderful bridal shower gift that elevates it to a new level! I received these party favors in rapid time! They are packaged just as they are pictured with the cute ribbon tied around them an all. I have not tested them out for functionality but I’m sure they work just fine. They’re a little smaller than I thought they would be, but I also didn’t read the specifications. Overall, very pleased with purchase. Used for a murder mystery party favor and it’s really nice! Only two things. No one knew it was a bottle opener because it doesn’t say so and I wish the color of the box were different but other than that the item is beautiful. I want everyone know how completely happy we are the the wedding favors we love ordered. Everything we ordered were absolutely beautiful as pictured on the site. We were concerned if we would actually receive them in time. To much of our surprise everything arrived in a very timely fashion even much faster then we had expected. Nothing broken and packaged well. Anyone thinking of ordering rest assured of good quality and pricing and good delivery. I will be ordering from them again. Love this wedding favor for the guys!! Great quality and beautifully gift boxes! Will be ordering more soon!